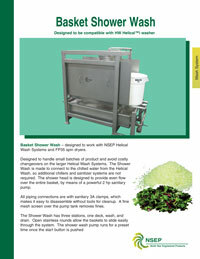 Designed to work with NSEP Helical Wash Systems and FP35 spin dryers. Designed to handle small batches of product and avoid costly changeovers on the larger Helical Wash Systems. 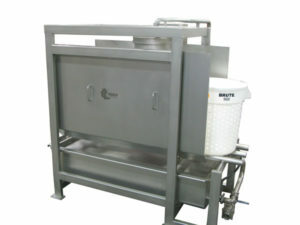 The Shower Wash is made to connect to the chilled water from the Helical Wash, so additional chillers and sanitizer systems are not required. The shower head is designed to provide even flow over the entire basket, by means of a powerful 2 hp sanitary pump. All piping connections are with sanitary 3A clamps, which makes it easy to disassemble without tools for cleanup. A fine mesh screen over the pump tank removes fines.